I have a small confession to make, this one kinda crept up on me. I have recently started a new job and the last month has just flown by. July anyone? Did that actually happen? So forgive my brevity in this post. As this whole ice cream cake, photographs and the written post all came together in less then 36 hours. I am usually far more organised and have things ready weeks before they are needed. But not this time, it is nearly 10pm the night before posting and I am having to get everything ready for work tomorrow in-between sentences! 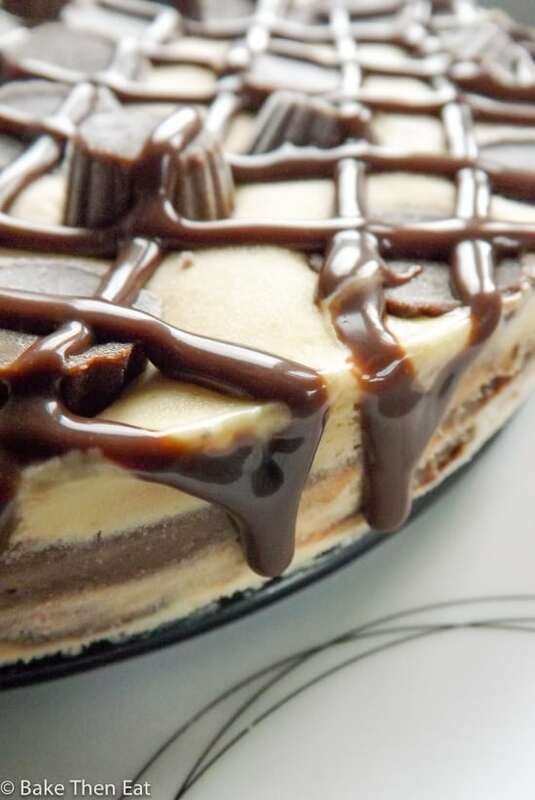 But enough about my moaning, lets get back to what you are all here for the Peanut Butter Chocolate Ice Cream Cake. Where I live it is very difficult to get hold of peanut butter ice cream. I can get a Ben and Jerry’s peanut butter ice cream, but it is full of inclusions. So no good for this recipe. So I had to make my own. All I did was use a half decent vanilla ice cream, a good one but certainly not the most expensive one and added some peanut butter. Gave it a good mix up and hey presto “homemade” peanut butter ice cream. But by all means if you live somewhere peanut butter ice cream is readily available, then use it to save you even more time! Because this was an “easy” cake to put together I used a shop bought chocolate filling for my chocolate layer and drizzle. All I used was frosting in a can. It was cheap and cheerful and kept the cost of this treat down. But by all means use a homemade chocolate filling if you prefer too. Once it was all set and ready to serve I drizzled a little more of the chocolate frosting over the top and hey presto a fabulous ice cream cake ready to go. Just a quick word about the crust, I used chocolate cream Oreo’s for my crust but any chocolate cream cookie will do. Or even original Oreo’s would work well with this frozen treat! It’s just cookies blitzed in my food processor with a little added melted unsalted butter. Simple! 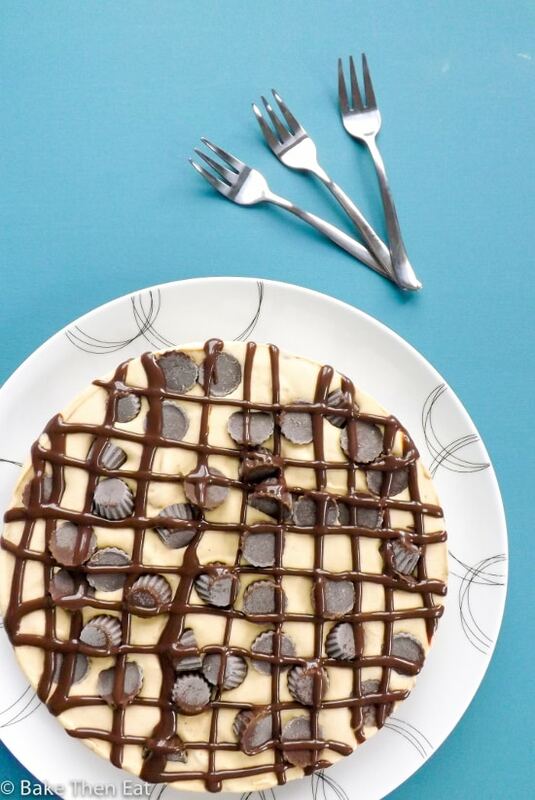 An easy to put together dessert, Peanut Butter Chocolate Ice Cream Cake is a great party dessert. 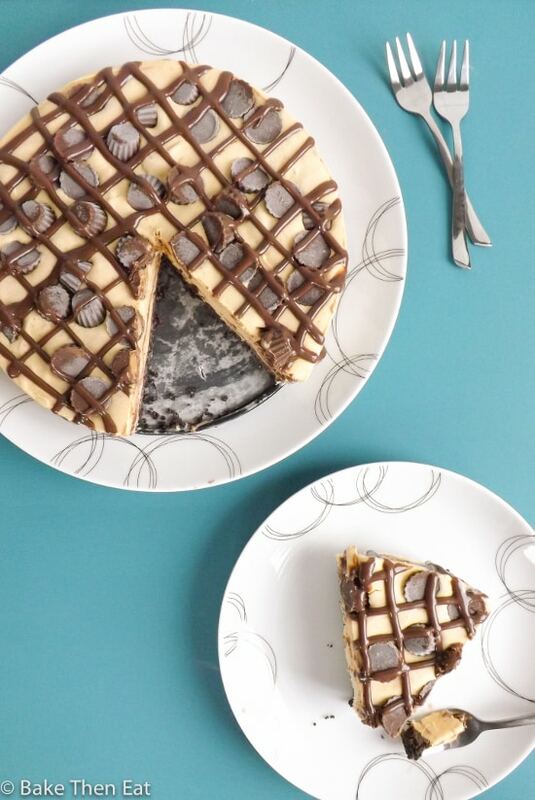 Packed with peanut butter and chocolate flavours. Get an 8 inch / 20 cm springform pan and line the bottom of it with baking parchment. Stick it down with a smear of butter. Melt your butter in a microwave for 15 seconds then place to one side. Break your chocolate cookies into pieces and place them a food processor and pulse them until they look like sand. Pour in your melted butter and pulse for a few seconds until all the crumbs are well coated. Pour the butter coated crumbs into your pan and press them down with the back of a spoon until the whole base is covered with a thin layer. Place the tin in the freezer for the next 30 minutes. After the base has been in for 15 minutes take your ice cream out of the freezer and let it sit at room temperature for 10 to 15 minutes. Depending on how warm your room is. You want it soft enough so you can poke your finger into it and leave a dent. Not go right through it. Get your stand / electric mixer ready and place the ice cream along with the peanut butter into the bowl and beat until they are well combined. Pour half of the ice cream on top of your now frozen cookie base. Take your chocolate filling and spread a thin layer over the ice cream. You may need to give it a 10 second blast in the microwave to make it more spreadable. I did! Then carefully spread the remaining ice cream over the top and sprinkle over the peanut butter cups. Cover the cake pan with clingfilm / plastic wrap and place in the freezer for at least 6 hours. Take out of the freezer 10 minutes before serving. After 10 minutes gently remove the springform pan from around your ice cream cake. If its still a little sticky use a warm knife and run it around the edges to loosen it. Take your extra 2 tablespoons of chocolate filling and if it is a little stiff give it a 10 second blast in the microwave. Pour it into a small plastic bag snip the end off and drizzle it all over your ice cream cake and serve. Replace any undated cake back in the freezer, covered with plastic to stop a build up of ice crystals. 1. This recipe will also need at least another 6 hours but it is inactive time.2. 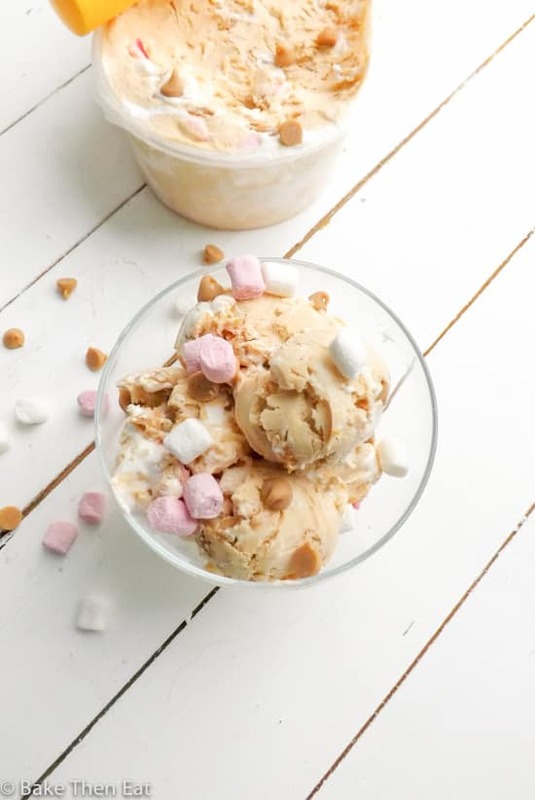 If like me it is difficult to come by peanut butter ice cream then follow the recipe to make your own. But if peanut butter ice cream is readily available then by all means use it and skip the mixing of the vanilla ice cream and peanut butter steps.3. I would recommend eating this dessert within 4 weeks. Do you want to join in on the peanut butter bash fun? If so, email Miranda and request to join the Peanut Butter Bash facebook group! 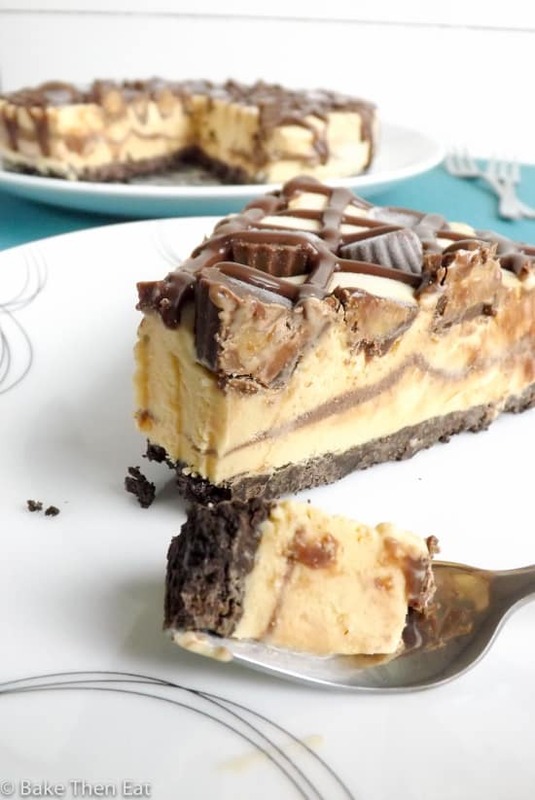 The first Thursday of each month we post a dessert with peanut butter and a mystery ingredient. 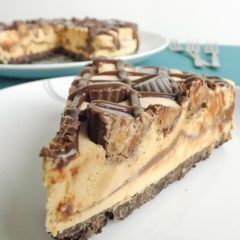 There is also a Facebook group if you want to join in the fun but don’t run your own blog The Peanut Butter Recipe Box. Here are the other peanut butter and Ice Cream creations! Wow!! this ice cream cake looks incredible!! 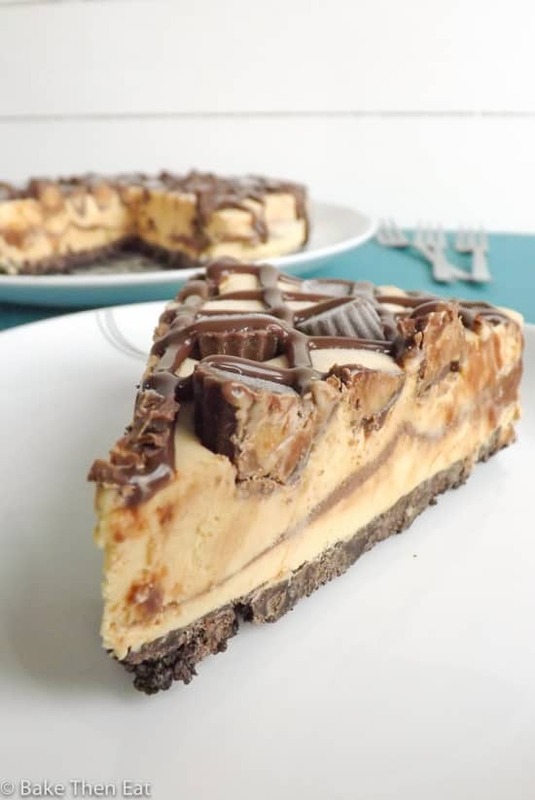 I wish I had a huge slice of this right now… Peanut butter and chocolate my fav combo .. so this is a definite hit with me!! 😀 Love it! Hi Arpita, thank you 😀 PB & Chocolate are just perfect together which makes this cake far to tempting! Hi Brianna, thank you. My job definitely has a more flexible schedule so hopefully I will be able to update a little more often and bake a lot more seasonally. Hope the new job is going well Emma! And this ice cream cake looks soooo good. I love anything with peanut butter and chocolate and as a frozen treat? Even better! Hi Ashley, thank you its going really well 😀 There is something so irresistible about PB & chocolate! Hi SaraLily, thank you so much 😀 Once the first slice was cut, it was game over the cake was devoured! Congrats on your new job, Emma! Ice cream cakes are my favorite! 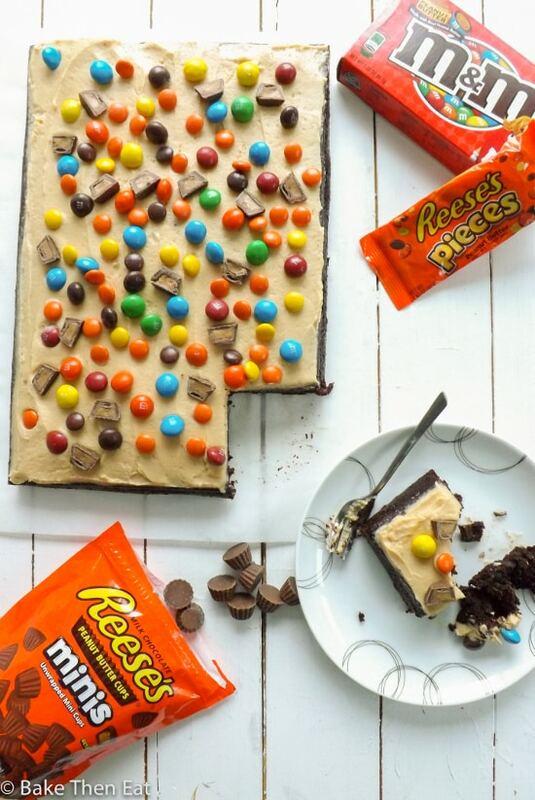 Love the peanut butter and chocolate combo! It looks fantastic! Hi Kelly, thank you so much it’s going well 🙂 I took total inspiration from you with the ice cream cake as you make such wonderful ones! This cake looks absolutely delish, Emma! No one can say No to this beauty! YUM! Ohhhhhh this ice cream cake looks absolutely amazing!!! Nothing can be wrong with ice cream + chocolate + peanut butter during the summer!!! Such a glorious ice cream cake! I simply can’t resist anything with peanut butter. Hi Angie, thank you PB is also one of my weaknesses!